Marriott International (NASDAQ: MAR) announced its inaugural participation in Alibaba’s ‘Tmall Super Brand Day’ slated for 28th July 2018, the first hospitality company to do so. Tmall is Alibaba’s Chinese-language e-commerce platform for brands and retailers, with access to over 500 million annual active consumers across Alibaba’s China retail marketplaces. Introduced in 2015, the Tmall Super Brand Day is a campaign driven by Tmall which spotlights select brands for Chinese consumers. Each participating brand has a 24-hour period to offer unique experiences, promotions, flash sales and special offers on the Tmall storefront. 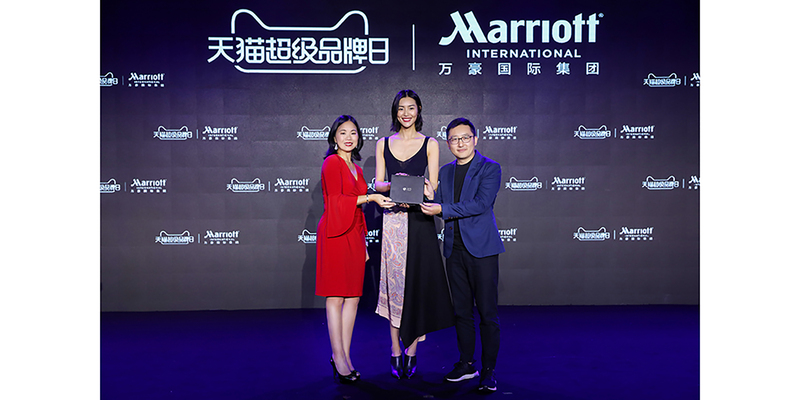 Themed ‘Boundless Experiences, Extraordinary Travels’, Marriott International kicked off its Tmall Super Brand Day debut in an offline ceremony held at W Shanghai – The Bund today. The event was graced by International Chinese supermodel Liu Wen, who is also featured in a series of collateral to commemorate the occasion. As one of the highlights of its Tmall Super Brand Day offer, Marriott International unveiled exclusive ‘Black Cards’. Holders of these limited-edition cards can enjoy unique hotel packages with curated experiences across five destinations – Thailand, Japan, Maldives, UK and USA – top destinations for Chinese travelers; and five of Marriott International’s luxury brands – W Hotels, The Luxury Collection, The Ritz-Carlton, St. Regis and Edition. These unparalleled experiences include Broadway VIP backstage access and cast meet-and-greets, stunning private helicopter tours over the city, personal shopper with skip-the-line service at a hip shopping collective, and exclusive artisanal chocolate-making workshops. A dedicated travel consultant will be available to help with travel arrangements. With its digital platform and solutions expertise, the Joint Venture between Alibaba and Marriott International identified the opportunity to create the hospitality industry’s first Tmall Super Brand Day. Marriott International, Tmall, and the Joint Venture team collaborated to design an innovative 7-day campaign, including the pre-sale period, inviting Tmall members to experience global travel with Marriott International’s portfolio of distinct brands. The campaign includes innovative engagement opportunities, exclusive benefits, lucky draws and other extraordinary experiences. The Joint Venture recently launched a new Marriott International storefront on Fliggy, the travel service platform of Alibaba, providing Alibaba and Marriott members access to Member Rates, double points, Post Post Pay functionality for over 1000 Marriott International hotels; and access to Li Yu certified hotels around the world. To celebrate the Tmall Super Brand Day, Marriott International will offer special promotions featuring F&B, hotel packages with local experiences and opportunities to win lucky draw prizes. Member rates of up to 10% off will also be available at select Asia Pacific properties. Promotion is only valid through 28th July 2018, 2359h (GMT+8) and for bookings on the Marriott International storefront on Fliggy. Marriott International’s participation in the Tmall Super Brand Day capitalizes on Alibaba’s consumer insights to target the fast-growing segment of sophisticated Chinese consumers. Along with Marriott International’s strong brand portfolio and extraordinary experiences offered at each destination, the company is set to provide travelers with an unprecedented range of choices. To experience Marriott International’s Tmall Super Brand Day, visit here. Note on Forward-Looking Statements: This press release contains “forward-looking statements” within the meaning of U.S. federal securities laws, such as the estimated five-year growth figure for Chinese outbound travel and the anticipated benefits from the joint venture. These statements are made under the “safe harbor” provisions of the U.S. Private Securities Litigation Reform Act of 1995. These forward-looking statements can be identified by terminology such as “will” and “expect” and similar statements. Forward-looking statements are not historical facts, and involve inherent risks and uncertainties. A number of factors could cause actual results to differ materially from those contained in any forward-looking statement, including in this case the risk that a new program such as this joint venture may not be successful or fully achieve the objectives of the participants. Further information regarding these and other risks is included in Alibaba Group’s and Marriott International’s filings with the U.S. Securities and Exchange Commission. We make those statements as of the date of this press release, and we undertake no obligation to publicly update or revise any forward-looking statement, whether as a result of new information, future events or otherwise, except as required under applicable law.